One of the greatest treasures of the Time Machine Rooms are the stories collected all over the country, around seventy three years ago. 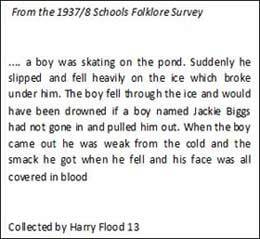 In 1937 /38 the Folklore Commission invited every school child to collect stories from older relatives and neighbours. 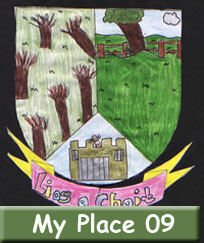 Each school, at the time recived a booklet suggesting topics such as "Hidden Treasure" or "The Forge", or "Old Cures" or , one of my favourites, Local Heroes". The collected stories, in copy books, were sent to Dublin. There, they were put onto microfilm. 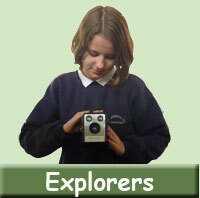 It is copies of this microfilm which is held by the County Library "Time Machine Rooms". Reading these stories can send shivers down your back. Just imagine, you can be reading one of these stories to a class. (or they are reading the stories themselves) Maybe it is a story about the local fair day. It was collected by a local girl of about twelve, back in 1937, from a neighbour of seventy six. She is talking about something she remembers when she was ten. Suddenly you realise that you have jumped back more than 140 years and are listening to a direct story from that long ago. And it is not just one story. There are so many stories from this collection, from almost every school in the counntry. It is even more exciting when someone recognises the name of the story collector. I remember one girl going very qiet and then saying "But that girl who collected the story. that's my grandmother's sister". And suddenly there is no distance between the years. That is history and that is why I call the Local Studies Library rooms, "Time Machine" Rooms. 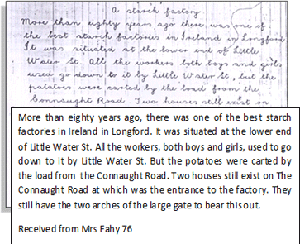 Some of the stories were helpful in giving information about Longford . There were stories that old us about other industries like brickworks, a distillery, a spool makers and more. 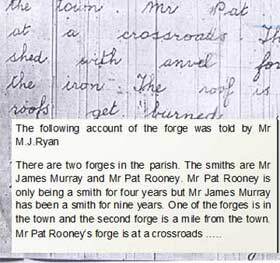 John told us "Everyone gathered in the forge because it was a warm place to be. The smith was always very busy. Not only did he make all the horseshoes for horses and donkeys but he would make metal rims for the cart wheels. He had no running water in the forge so he would go to the green where the pump was (opposite the library). Here he heated and cooled the metal rims to fit them on the cart wheels".